Appointed by contractors McAleer & Rushe for UNITE Students, Charon consulted with landscape architect, Harrison Stevens, to recommend the best hard landscaping products to complete the aesthetics of the street frontage on St Leonards Street and a private courtyard within the student accommodation area. 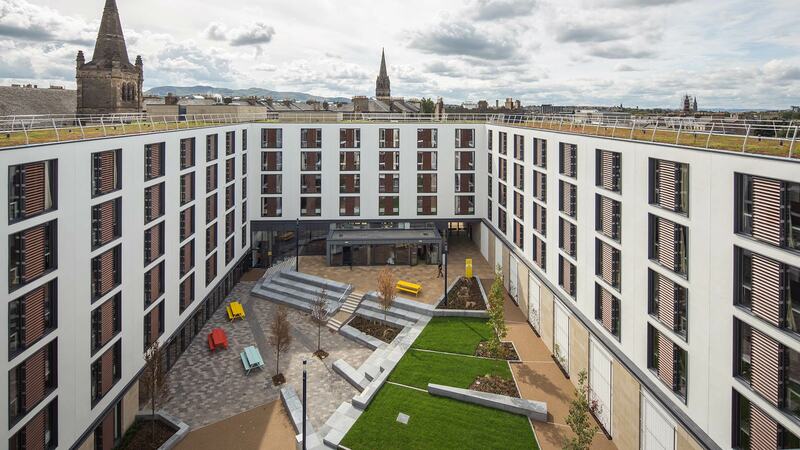 In a partnership approach with McAleer & Rushe, and groundwork contractor M Squared, Charcon managed the supply of StoneMaster® in a variety of different sizes and shades, whilst working to a challenging construction programme. By working closely with both parties, Charcon was able to ensure the correct product was available when required and complete the work within the designated timescales. 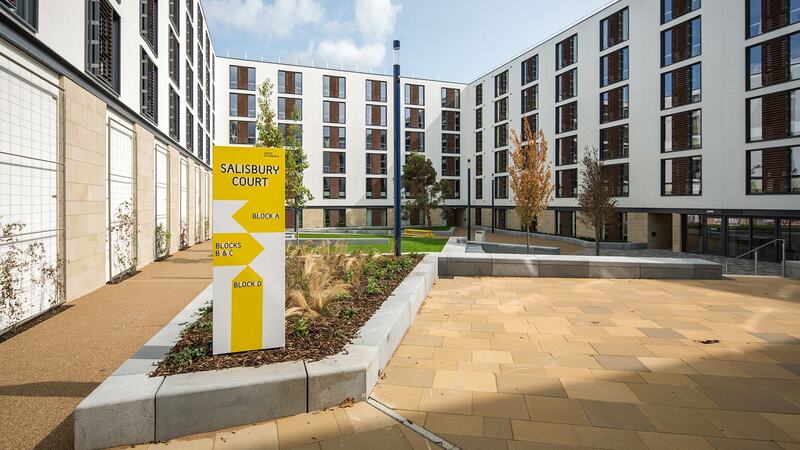 More than 1,100m2 of StoneMaster®, a premium precast concrete flag and block paving product, was supplied by Charcon to provide a high quality paving solution which complimented the stone clad of the surrounding building. Supplied in Sandy Buff, Sienna Buff, Amber Buff, Light Grey, Medium Grey and Dark Grey, the result was a visually pleasing design that respected the historic context of the neighbourhood, whilst providing a central courtyard for students to congregate and interact safely. StoneMaster® is a revolutionary block and flag paving with all the inherent beauty of indigenous stone. The fine sandstone has a washed finish and replicates natural sandstone and granite. The product is made from 50% reclaimed and recycled material and is a cost effective solution to natural stone. Offering fixed plans for ease of design, or a mixed pack containing long aspect pavers, StoneMaster® Flag is suitable for pedestrian areas with light vehicle traffic. For further information, please visit www.charcon.com. For technical support, call 01335 372 222 or email landscaping@aggregate.com. For further information on M Squared (Scotland) Ltd, call 0141 297 1081 or email www.msquared.co.uk.